"What can you show me that I haven't seen before?" 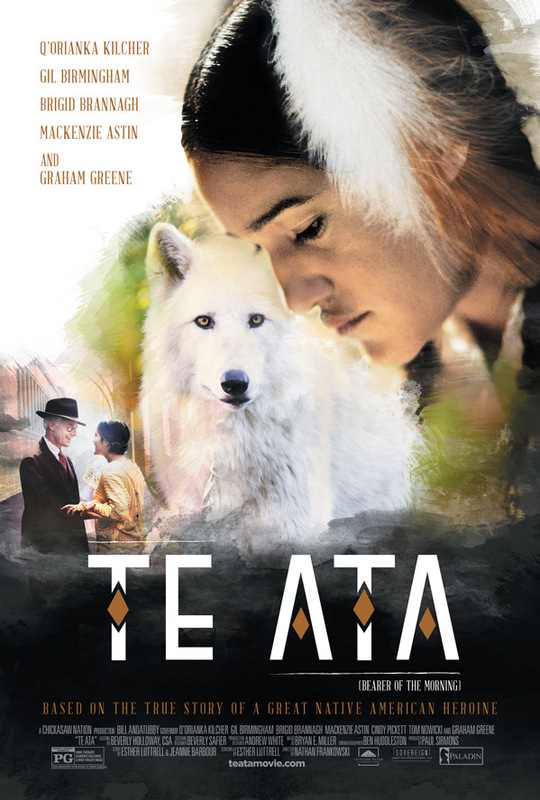 Paladin has debuted the official trailer and poster for an indie biopic titled Te Ata (pronounced TAY AH-TAH), telling the true story of the renowned Chickasaw storyteller who entertained at the White House, befriended the First Lady, performed for European Royalty and on stages around the world in an illustrious career that spanned more than sixty years. Native American actress Q'orianka Kilcher stars as Mary Thompson Fisher (aka Te Ata Thompson Fisher), who dreamed of being on Broadway but was constantly rejected. Born in Indian Territory, and raised on the songs and stories of her Chickasaw tribe, Te Ata's journey to find her true calling led her through isolation, discovery, and love. The cast includes Graham Greene, Gil Birmingham, Brigid Brannagh, Mackenzie Astin, and Cindy Pickett. If you're curious about this film at all, the trailer is definitely worth a quick look. Enjoy. Te Ata is based on the inspiring, true story of Mary Thompson Fisher, a woman who traversed cultural barriers to become one of the greatest Native American performers of all time. Born in Indian Territory, and raised on the songs and stories of her Chickasaw culture, Te Ata’s journey to find her true calling led her through isolation, discovery, love and a stage career that culminated in performances for a United States president, European royalty and audiences across the world. Yet of all the stories she shared, none are more inspiring than her own. Te Ata is directed by indie filmmaker Nathan Frankowski, of the films Unlimited, To Write Love on Her Arms, No Saints for Sinners, and Expelled: No Intelligence Allowed. The screenplay is written by Esther Luttrell and Jeannie Barbour. This premiered at the San Diego Film Festival last year. Paladin will open Te Ata in select theaters starting September 29th this fall. Who's interested?